Make the most of Colombia’s spectacular landscapes, streetscapes and fascinating people by choosing Bogotá and Cartagena as your destinations for professional photography tuition. The Colombian Way loves photography and has worked closely with The Colombian Photographic Society to bring you expert courses that are based on morning tuition sessions combined with afternoon practical sessions in some of Colombia’s most spectacular destinations. Have a fantastic vacation and supercharge your photography skills at the same time. We have thought about everything and designed these exclusive courses around your needs. Your course will include private airport transfers to one of our charming partner hotels, each chosen for its character, quality and facilities for your morning classroom session. Each course lasts one week with 5 days of intensive tuition plus a final day free shoot, presentation of work and social meet up. Each and every day of each course includes a guided outing with your tutor to one of our incredible day trip locations. Each tuition session is geared towards that day’s outing in order to teach you something relevant to the location and help you make the most of your trip. Our courses are not only fantastic fully featured vacations in their own right but with expert guidance, they guarantee that you take home incredible photographs of your time in Colombia. Our photography courses are ideal for groups of 4 to 8 people, larger or smaller groups can be arranged by agreement. Enthusiastic young photographers are welcome to participate in our courses. The courses are intensive and technical, group leaders should decide if the courses are appropriate for children. For groups with minors, the evening social sessions will be varied accordingly. Getting the most from your camera: Whether using a compact camera or a DSLR this intensive 6 day course is perfect for those wanting to progress from using their camera’s automatic mode. You’ll learn how to use both basic and advanced features of your camera through a mixture of half-day classroom and half-day practical sessions and you’ll return with stunning images taken in beautiful Colombia. The course runs from Monday to Saturday with an optional meet up the preceding Sunday evening. All students are encouraged to prepare a short introductory presentation of themselves and their photography and then there will be a final presentation of the week’s work on the Saturday evening. Arrive Saturday evening or Sunday daytime depending on your origin. We will collect you from the airport and take you to your hotel in Bogotá’s La Candelaria, the city’s historic colonial centre. Your classes will take place in the hotel’s comfortable breakfast room, or depending on the weather, on the roof terrace. Evening: Dinner and drinks, meet your tutor and get to know each other. Afternoon: Transfer to the Salt Mines of Nemocón for your afternoon photography session, working in low light conditions. Afternoon: Photography session in Bogotá’s Botanical Garden, nature photography and macro. Afternoon: Transfer to the Cloud Forest of Chicaque for your afternoon photography session, working with variable light and landscape photography. Evening: Presentation of students’ work, social evening with dinner and drinks. Advancing your skills: Either you have completed our course in Bogotá or you are an enthusiastic amateur that wants to improve your skills with our in-depth course in Cartagena. Our Cartagena course teaches you more advanced skills and having completed it you will have a substantial mastery of your photographic equipment. This UNESCO world heritage site makes for the perfect backdrop, a spectacular holiday destination in its own right. Once again this course is based on expert tutorial sessions during the morning and practical sessions in and around the city. Our Cartagena course offers a slightly different timetable to make the most of Cartagena’s beautiful sunsets and warm ambient lighting during the late afternoon. The course also includes a night walk to perfect your low-light streetscape skills. Arrive Saturday evening or Sunday daytime depending on your origin. We will collect you from the airport and take you to your hotel in Cartagena’s historic walled city. Your classes will take place in the hotel’s courtyard or on the roof terrace. 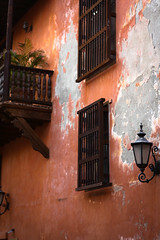 Afternoon: Photography session, a tour of Cartagena’s bohemian Getsemaní district, capture the very essence of the city’s most authentic colonial neighbourhood. Afternoon: Early afternoon is free to explore Cartagena at your own pace. At 3pm we meet for your photography practical session, commencing with seascapes and cityscapes then continuing with sunsets over the Caribbean. Afternoon: Photography session. Build on your understanding of composition from Monday and test-drive your new knowledge from Wednesday’s morning session with a flash-free photography outing to one of Cartagena’s churches. Photographing people. Movement, portraits, candid zoom photography and the composition of wide-angle shots. Cues for approaching subjects for portrait photography. Afternoon: Photography session. The first half of the afternoon you take to the streets alone to capture portraits and candid shots. Fruit sellers, hawkers, waitresses and tourists. We expect you to capture a good selection of Cartagena’s many faces. We meet up once again at 4pm as a group to photograph Cartagena’s famous Palenqueras and street dancers. Afterwards we go on a night walk to capture street scenes and architecture. Off-camera flash: Equipment, Light, working with a single light source, reflectors, high-speed synchronisation and blending artificial and ambient light sources. Afternoon: Photography session. Late afternoon sunset portraits with off-camera flash equipment. Master the art of post-processing: Photoshop Lightroom, developed by Adobe Systems for the Windows and Mac operating systems is arguably the world’s most powerful digital photography processing application. Consider it your very own desktop darkroom. Our intensive 3 day Lightroom course is classroom based and aims to give you a ground-up understanding of Lightroom so your photography skills are enhanced with the industry leading post-processing functions of the Lightroom application. Post-processing in Lightroom can turn a great photograph into a truly spectacular photograph. Upon completion of the course our expert tutor will have furnished you with the skills and abilities to make the very most of the files captured by your camera. The course duration is 3 days broken up into 6 half-day sessions. Each new session builds upon the previous session’s knowledge to provide you with a thorough understanding by the end of the sixth session. The develop module is the main part of Lightroom and where you’ll do most of your work. Over two full days we will guide you in a detailed and comprehensive exploration of all of the facilities available for global and selective processing in both colour and black & white. The above image of Laguna Guatavita is a screen grab from Lightroom‘s Before and After view mode. The processed image takes advantage of a number of Lightroom‘s develop mode functions including spot removal, saturation adjustment, recovery, graduated filters and highlight/shadow adjustment. Our 3 day Lightroom course takes place either in our offices in Bogotá or on location in Cartagena. If you are also doing one of our photography courses, ideally the Lightroom course would take place afterwards. If you are doing both of our courses then our Lightroom course can take place between the two courses or after our Cartagena course. The course is also available as a stand-alone for those that only wish to study Lightroom. The Colombian Way already offers two comprehensive courses and a range of photography day trips in and around Bogotá. If those don’t serve your needs then speak to us about building a custom course to your own exacting requirements. The Colombian Photographic Society’s expertise behind the lens coupled with The Colombian Way’s expert travel planners’ unbeatable knowledge of Colombia is the perfect solution for your own bespoke photography course. You tell us the area that you want to go to and we will build a course around it with varied subjects and environments. Why not arrange your own short course geared specifically towards one of Colombia’s truly unique locations. Consider studying the art of photography and having your tuition geared towards incredible destinations such as Caño Cristales or La Guajira. Prefer studio based tuition with models? We can organise this too. Take advantage of Colombia’s low modelling fees and capture live subjects. Want to spend time studying a specific technical aspect such as off-camera flash? Let us know exactly what you need. Use our contact form to tell us about your own specific photography needs. All prices shown on this page are based on a group of 4 people. Prices will be adjusted accordingly for smaller or larger groups. Our ultimate combination of courses. Supercharge your photography skills on location in Bogotá and Cartagena then master post-processing with Adobe’s powerful Lightroom software. 17 days of intensive photography. The cost of our Lightroom courses depends on its location, whether you want accommodation included and whether you have continued on from either our Bogotá or Cartagena photography courses. The above price is for our non-residential Bogotá Lightroom course as a standalone course. Custom tours have custom prices. The options are almost limitless. Contact us for a quote.